We carry three sizes of Panda portable dryers, this one is the largest one.- 3.75cu.ft capacity. 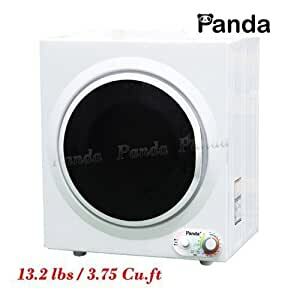 Brand: Panda Model: PAN760SF-GPS Color: White & Black Drying Capacity: 13.2lbslbs/6KG/3.75 cu.ft Voltage: 110V/60Hz Rated Input:1500W Tumble Material: Stainless Steel Drying Program: Cool(0-20mins), Warm(20-120mins), Hot(120-200mins),Air Dry(0-80mins) Heat selector : High, Low Automatic shut -off function Product Dimensions(W*D*H): 23.5*22.5*27.5 INCH / 60 * 56.5 * 70 CM Product Weight: 48.5 LBS / 22KG Package Dimensions(W*D*H): 26 * 24 * 30.4 INCH / 66 * 62 * 78 CM Gross Weight: 55 LBS / 24.5 KG • Venting: 1. It’s ideal to mount on the wall. Wall mounting kit includes. 2. Purchase an indoor dryer vent ,where you can find some retailer stores, like Homedepot. 3. Lightweight for easy portability. 48lbs to carry around, then as easy as opening a window. 4. It comes out warm air, it’s fine if leaving in the room in winter.